Endangered by neglect and in a state of deterioration, the A.B. Petrie Building has found a saviour. Tyrcathlen Partners, owned by heritage building restorers Kirk Roberts and Peregrine Wood, has announced an agreement to acquire the building at 19 Wyndham St. N.
Designed by Guelph architect John Day and built in 1882 for Alexander Bain Petrie, a pharmacist and successful businessmen, the four-storey structure is unique in Canada for its eye-popping faÃ§ade of stamped galvanized iron, and its mortar and pestle pediment. It is a designated Ontario Heritage Act building. As extraordinary as the faÃ§ade is, it has fallen into deterioration in recent decades, due largely to the prohibitive cost of restoration. Roberts said Tyrcathlen Partners was interested in the building because of its one-of-a -kind faÃ§ade and architectural design. The company previously purchased, restored and repurposed Guelph heritage buildings that became the Granary Building and Boarding House Arts, both in the city's core. 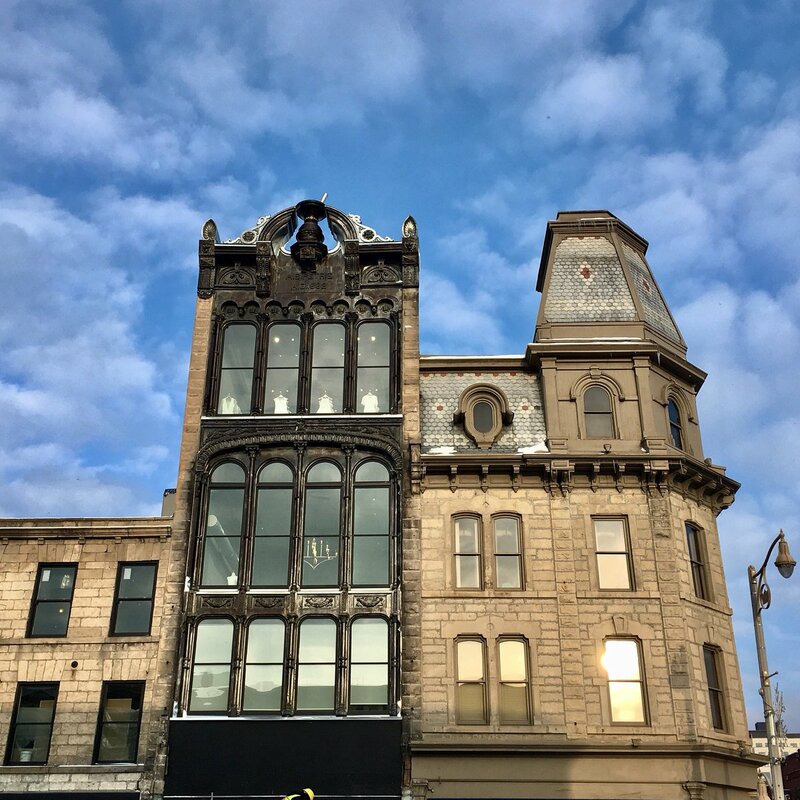 "We also believe our hands-on, attention to detail approach is the right fit for the challenge of bringing a building back to life that has been dormant for almost a century," Roberts wrote in an email. He added that Tyrcathlen expects the restoration to commence this spring. Restoration beginning this spring? Fantastic news for downtown Guelph. There's been a lot of great changes there; Carden Street and the city hall / Market Square are a great spot these days. Great news! What amazing office spaces this would make! Wow! Had no idea there was a thread here on this. I had Christmas Dinner with the senior mason on the project. I spent five years in Guelph, for better or worse, but one of the first things to catch my eye was the Petrie Building, pathetically boarded up (which ironically saved its life) and a greasy spoon on the ground floor who wouldn't sell the place, even though the three upper floors were empty and work orders were pending. 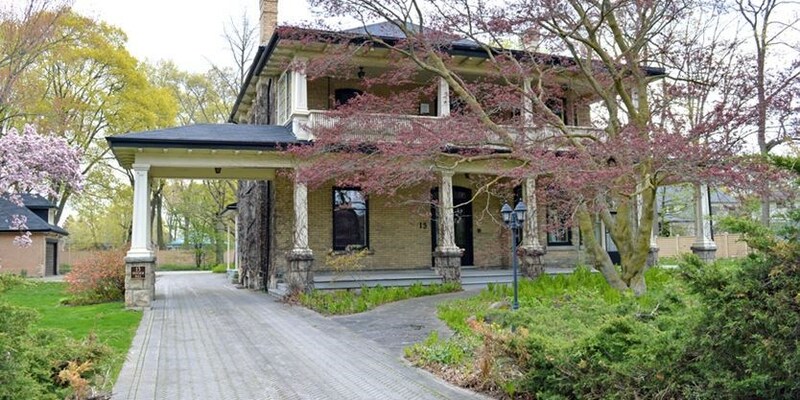 City staff and Heritage Guelph are rushing to save what’s left of an historically significant home located a short volley across from the tennis courts in St. George’s Park at 13 Stuart St., known as Cutten House. A recommendation by the advisory committee set the wheels in motion for an emergency heritage designation of the property last week and now it’s headed for a city council vote May 23. City of Guelph Building Services staff ordered contractors to obtain proper permits in September and issued a stop work order for all demolition work. Building officials have been monitoring the site since then. The owner, John Rennie, lives next door at 21 Stuart — a large, modern estate with elaborate gardens. “It’s a work in progress,” he said from his pickup truck in the bricked driveway leading off 13 Stuart. Rennie has not responded to recent emails from city staff regarding designation of his property. On May 11, the owner was notified through email that council will consider the matter on May 23. But as of the time their report was written and posted last week, planning staff hadn’t received a response from Rennie about those communications. The drive leads past the two-story, yellow-brick house, with covered verandas on both levels at the front. Landscaped gardens are growing wild all around and a venerable Japanese maple spreads its arms across the front facade, hugging the old building. Originally built in 1891 for lawyer Frank Hall, the house is an example of Guelph Edwardian architecture with Italianate styling. Arthur Cutten purchased the property in 1904 and added the verandas, a “porte cochère” extending across the driveway (an overhang), an addition at the back and a sunroom on the southeast side of the house. Gardens were designed and constructed around the property in the intervening years as several members of the Cutten family made “Tranquille” their home through to the 1960s. Arthur Cutten himself lived in Chicago and made millions speculating commodities on the New York Stock Exchange, sprinkling his earnings liberally around the City of Guelph. Ida and John Pellettier owned the 1.2-acre property until listing it last year for $1.8 million. The "superior design and craftsmanship of the home and gardens, the cultural legacy of the Cutten family as well as the property’s place and heritage along historic Stuart Street, next to other culturally important homes such as Ker Cavan, which received heritage designation in 1986, deem 13 Stuart worthy of the same protection, the report says. The property has been on the heritage registry for years — essentially a waiting list of old buildings that may be worthy of a heritage designation. Kirk Roberts, a principal partner with urban heritage property specialist Tyrcathlen, lives across the road and has watched the guts of the quaint home tossed out into dumpsters. Pending council approval on May 23, anyone objecting to the designation has a 30-day period to state their opposition. Heritage designation would include basically the exterior of the building, a detached garage, original landscaping, including mature trees, and the original metal fencing that runs along Stuart Street. Heritage designations can go too far in some cases, to the point of discouraging ownership of them, but in other cases, and I'm proud of Guelph on this one, the best can be saved. In the case of the Cutten House, it was an innocuous comment by a jobber with a truck to a trade craftsman that saved the house. Said craftsman called the partners behind the Petrie building (Tyrcathlen) and the City was immediately notified, even though it was a weekend. An injunction was obtained on very short notice, and the Cutten saved. That's one of the wonderful sides of a smaller city (big town really) like Guelph. It's not just the monetary value that counts, it's the *community value*. Guelph's like an old girlfriend I still dearly love. Guelph once had some stunning architecture downtown. I love this building- a real head turner, my immediate thought when I first saw it 20 yrs ago was I hope at least this one gets restored. It looks fantastic.